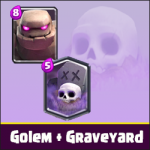 Golem and Inferno Dragon deck | Clash Royale fan-site! 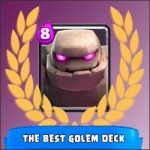 Home » BLOG » Golem and Inferno Dragon – an unstoppable deck! 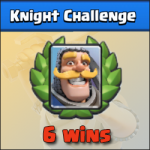 Short thematic challenges (up to six victories) that periodically take place in Clash Royale is a very good opportunity to try all cards available in the game. Frankly speaking, I try to use this ability every time. Accordingly, I start every such new challenge with a new deck that has at least one card I’ve not found yet in common game. During the last such challenge (Furnace challenge), I decided to try a very interesting combination of Golem and Inferno Dragon and the result was very decent (I won that challenge easily)! Golem. This is one of the most powerful epic card in Clash Royale! A huge stone creature that is aimed only at buildings and has huge stock of health (at the tournament level Golem has 5 984 of hitpoints including the health of two small Golemities)! Therefore, Golem usually reaches its target. The main his role in this combination is to attract attention of enemy troops and provide more time for Inferno Dragon could reach the Tower! Inferno Dragon. This is one of the legendary cards in Clash Royale and the key card in this combination. The dragon is a flying prototype of Inferno Tower (shoots a beam of fire the damage power of which increases over) that makes him useful both in attack and in defense! Accordingly, we can allow yourself not include a separate tank killer card in the deck. Of course, a separate building acts better in the role of tank killer but to my mind with such combo, our opponent should think about the defense more 🙂 In addition, Inferno Dragon has a decent stock of health (1,070 of hitpoints). Deck for Golem and Inferno Dragon. Log. Low cost and good effectivity against troops with low hitpoints. Wizard and Executioner. Two very similar cards with the same cost (5 drops of elixir) because both of them are able to cause an area damage and attack both an air and ground targets. 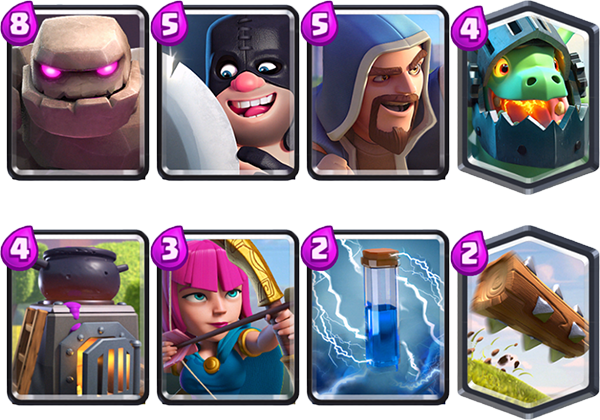 The main role of these cards in the deck is cover Golem and Inferno Dragon. Furnace. This card was in the deck optionally but frankly speaking, furnace suits this deck perfect. Archers. This card selected into a deck for the defense purpose mainly. Zap. Very effective and cheap card in Clash Royale. With the help of Zap, we can easy eliminate such cards as Skeleton Army, Goblins etc. Also it’s very useful against Inferno Tower (one shoot freeze Inferno Tower for a 0.5 sec and reduce it’s damage power to the lowest level). Golem and Inferno Dragon deck tactic. Golem. Place him at the lowest part of arena near the King’s Tower. His low speed of movement allows to gather enough of elixir for deployment of another character near the bridge. Place Wizard or Executor behind the Golem near the bridge. In such position, he will be able to attack enemy that will be busy with our golem. Throw Inferno Dragon into a battle! P.S. Of course, it’s difficult to place all these three cards in such order due to opponents action. But in mostly cases if you put Golem onto arena first, an opponent begins to think about own defense and don’t begin own attack. Thus, start the attack first! Tagged Decks, Golem, Inferno Dragon. 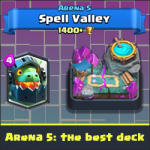 « Arena 6: the best deck ever (no legendary cards)!